Offer martins a new place to colonize using the Heath Cedar Crescent Entry Purple Martin House Package. The classic, Heath Cedar Purple Martin House adds a traditional look to your backyard, and provides 12 separate, cozy apartments for your feathered friends. The crescent shaped entries for each compartment help deter starlings from overtaking the unit, while the cedar construction forms a lasting and sturdy home. Attach the two included Heath Deluxe Purple Martin Decoys to the roof perch, for easily attracting these birds. The included Stokes Purple Martin Book provides a wealth of information on maintaining a colony, helping your feathered friends thrive. 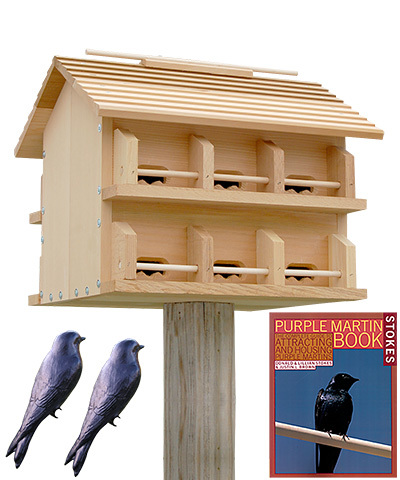 Enjoy martins, and not starlings, roosting in your yard with this Cedar Crescent Entry Purple Martin House Package.